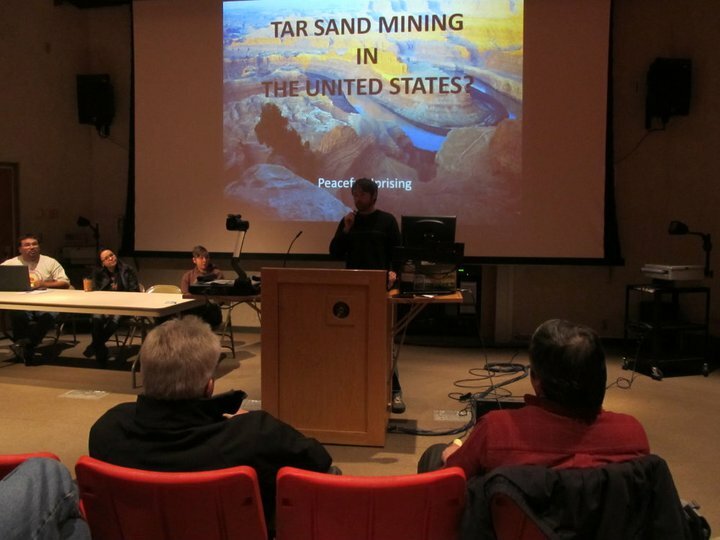 The inaugural International Tar Sands Resistance Summit (ITSRS) wrapped up near Missoula last Monday, November 22, with a packed house at the Missoula City Council meeting. As the first true snowstorm of the season coated the street outside, inside the council was voting unanimously to double the cost of hauling oversize loads through the city in reaction to community backlash against plans by oil sands companies to route equipment through Missoula. The summit, hosted by NRRT and the Indigenous Environmental Network (IEN) at Lubrecht Experimental Forest, mere yards from the planned path of the mammoth shipments along MT Highway 200; brought together nearly 100 activists from around the US and Canada who are concerned about tar sands development. Ashley Anderson, of Peaceful Uprising presents in Missoula about Tar Sands mining in eastern Utah. Workshops about tar sands issues and trainings in a diversity of tactics for resisting the industry’s growth helped connect the dots between anti-tar sands struggles in places from Oklahoma, to Montana, to northern British Columbia and elsewhere. Speakers from communities impacted by tar sands infrastructure painted an unfortunate picture depicting a (black) gold rush in the heart of Canada with global implications. 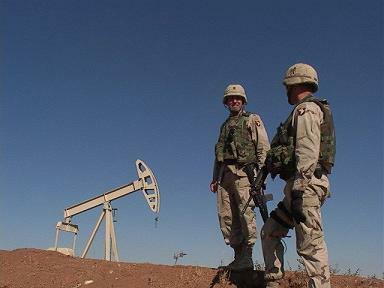 While the eyes of the world are on the oil wars in southwest Asia, a corporate-state free-for-all is spanning North America, with Ft. McMurray, AB at “Ground Zero”. The exploitation of Alberta’s bitumen (tar sand) deposits has been growing at staggering rates in recent years and foreign investment in the industry continues to swell. 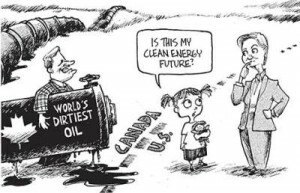 Private oil companies from western Europe and the US to national oil companies from eastern Asia are buying up stake in Canada’s tar sands as supplies of conventional “sweet crude” around the world begin to dry up. 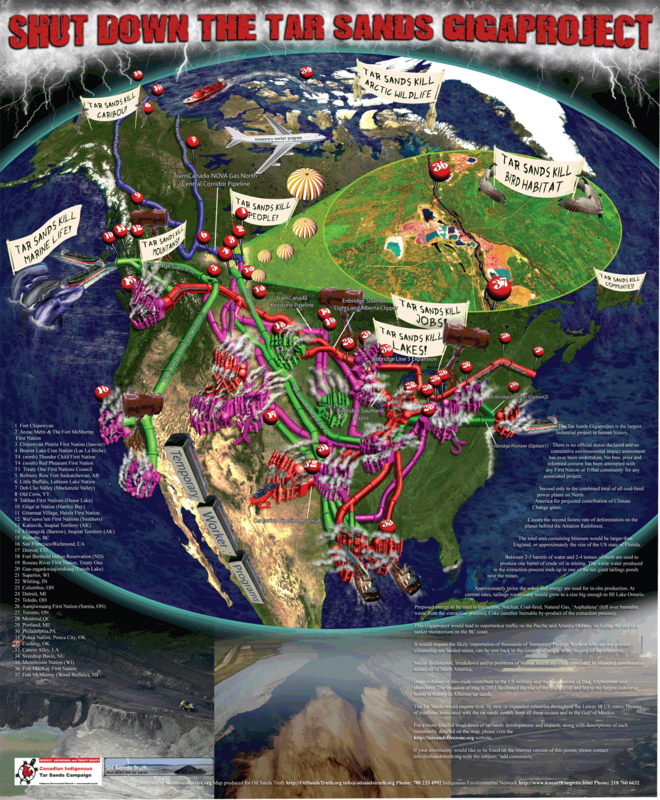 Facilitating this land-grab is a cross-continental network of pipelines and shipping corridors with which to import toxic chemicals and Brobdingnagian equipment, and to export oil to the highest bidders in the rest of the world. As the largest marine oil spill in global history was dominating news headlines, many looked to the tar sands to the north as an alternative to off shore drilling. With Canada already contributing more oil to the US than any other country in the world, and the North American Free Trade Agreement (NAFTA) locking Canada into an energy pact that guaranteed a minimum percentage of that country’s oil production flowing across its southern border, the United States tapped its own “wells” directly into the oil fields of Alberta. Wells in the form of pipelines. All angled towards the tar sands region near Edmonton, Alberta, a series of pipes up to 3ft wide criss-cross the border, feeding America’s addiction to oil. In fact, the US has tapped into the Canadian supply so much that Canada can’t keep up. Despite this fact, Canadian company TransCanada plans for the nearly 2000 mile long Keystone XL pipeline to connect the tar sands all the way to the Gulf of Mexico. Taking the land away… again. The tar sands focused summit near Missoula was Oklahoma lawyer Harlan Hentges’ first excuse to visit the area. The harsh, wintry conditions in the mountains above Montana’s Blackfoot river and the laid back, left-coastish vibe of the Missoula-area population both proved to be a bit of a shock for the third-generation Oklahoman; though he welcomed both shocks with enthusiasm. Hentges’ comes from an area of northern Oklahoma known as the Cherokee Strip, named after the record setting run on land formerly promised by the US to the Cherokee Nation after the Trail of Tears, but which was opened by the US to white settlement in 1893. His family has been ranching cattle there since they claimed their 160 acres in the run. Farmers and ranchers all through the central plains are tied to more than their land. They are tied to what’s under it too. The Ogallala aquifer is the lifeblood of America’s heartland, supplying a source of irrigation for 27% of US agriculture and drinking water for 2 million people. The Keystone XL pipeline is proposed to cross through the shallow groundwater source, worrying environmental groups that oil leaking from the pipe could have tragic consequences. Adding to this danger is the fact that the pipe is to be built with thinner than normal pipe walls. These days that land-threatening someone happens to be TransCanada. The Canadian oil-services company is trying to use the rule of eminent domain to acquire the rights-of-way it needs to run the Keystone XL down to the Gulf Coast refineries of Port Arthur, Texas. The US government is once again taking land away from residents of the Cherokee Strip, Native and settler alike, and handing it over to a colonizer who doesn’t even want to live there. Landowners are desperate to stop the Keystone XL, for fear that their generations-old way of life in the region is coming to an end. Hentges remarked that in this battle against the tar sands, the environmentalists and the property-rights folks want the same thing. “They just don’t usually know it,” he said. The ranchers of Oklahoma have even more in common with North America’s First Nations than a hot potato of broken promises on prairie land. 1800 miles away, British Columbia’s indigenous communities have voiced a resounding NO to plans by another tar sands company, Enbridge, to cross 700 miles of unceded coastal territory; in an effort to connect the oil supplies of northern Alberta to the Pacific Ocean. Enbridge’s Northern Gateway pipeline would bring natural gas condensate, a chemical used to slurry bitumen, to the tar sands. A parallel pipe would bring that slurry of synthetic oil from the tar sands to the deep-sea port of Kitimat, BC. The circuitous route of this proposed double-pipeline would send carcinogenic chemicals across three major watersheds and over a thousand streams, as well as the legitimate territories of some 50 non-consenting First Nations. The Canadian Energy Pipeline Association has warned that the vast majority of pipeline ruptures occur due to “time-dependent failure such as external corrosion or stress corrosion cracking.” Meaning that it’s not a matter of if there is a spill from one of the two parallel pipelines, but when. In one ten-year period Enbridge reported spilling 132,000 barrels of oil in over 600 spills. Recent oil spills in Michigan, suburban Chicago and Salt Lake City could have been worse had they gone longer before being noticed. Much of the 1400 miles of pipeline in the Northern Gateway plan would be in isolated, difficult to access regions of a mountainous and biologically-sensitive temperate rain forest. Additionally, Enbridge has a history of neglecting safety measures that would have prevented spills, as was the case in Michigan. The risk of spills arises from more than just the pipelines, and residents of the region remember all too well the consequences their Alaskan neighbors dealt with after allowing Exxon to operate in Prince William Sound. The oil set to flow through the Northern Gateway is not meant to end its journey in the coastal town of Kitimat. Up to 225 oil tankers per year, with a capacity of 2 million barrels each, would be required to navigate some of the most dangerous coastal waters in the world. A 1990 Environment Canada analysis of the likelihood of tanker accidents occurring in Canadian waters concluded that “based on current  levels of tanker traffic, Canada can expect over 100 small oil spills, about 10 moderate spills and at least one major spill offshore each year. A catastrophic spill (over 10,000 tonnes) may occur once every 15 years.” Click to see how a spill could affect BC coastal waters. Ultra Large Crude Carriers are the largest ships on Earth. Resistance to the Enbridge Northern Gateway project goes beyond First Nations. 80% of British Columbia’s population is believed to be opposed to oil tanker traffic on the province’s coast. Political players in Canada are fighting over both proposed and existing tanker moratoriums affecting BC’s coast. Why, if Canada’s Tar Sands can’t even keep up with demand for existing pipeline capacity, are oil companies spending billions to lay even more pipe? 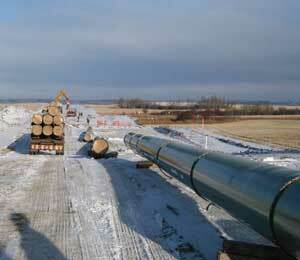 Tar Sands companies have no intention of leaving the pipes unfilled. The Canadian Association of Petroleum Producers expects oil production from the tar sands to more than double in the next 15 years. Currently, dozens of tar sand operations are planned or under construction in Alberta, with hundreds of other sites being explored for exploitation potential. As the mining facilities become more numerous, they are also becoming larger. In a business that profits in direct proportion to its ability to move the most volume of Earth that it can, bigger is better. This applies to ordering parts, too. Late in 2009, oil behemoth ExxonMobil quietly met with local governments in western Montana to promise great things for the small towns’ economies. The plan was to ship some 207 things politely called “modules” through the region. In exchange the company would spend a little money and build some parking lots, referred to as “turnouts”, in the middle of the forest. The modules turned out to be 500,000 lb Lego pieces of a new tar sand mine in Alberta. A three-story high coke drum waits out an expensive legal battle in Idaho. Perhaps in the offices of tar sand giants like Exxon or Conoco, in oil-friendly cities like Edmonton, Dallas or Billings; this sounded like a fine plan. But as with the settlers of the central plains, and the First Nations of the Pacific northwest, residents along the route of these shipments have a conflicting idea of what is good for them. What is known today as US Hwy 12 in Idaho and western Montana, served first as the route of Meriwether Lewis and William Clark’s expedition to the Pacific. In their time, the expedition served as a catalyst in the lives of indigenous people already living there. So began over two centuries of illegal immigration into what in 1805 was still Indian country; first to exploit it for gold and firs, later to possess it for settlement. Despite the legacy of colonialism in the northern Rockies, the river valleys of Idaho and Montana retain a resemblance to their pre-conquest conditions. Grizzlies and cougars still hunt these woods, salmon still spawn in the eddies. Missoula, MT, a small city of about 60,000 people, rubs against a federally designated wilderness area. Visitors to town are often treated to the sight of ospreys fishing the Clark Fork river right downtown. West across the 9000 ft Lolo pass from Missoula is the Lochsa and Clearwater rivers in Idaho. Tourism is the leading industry, drawing $150 million into the region’s economy. 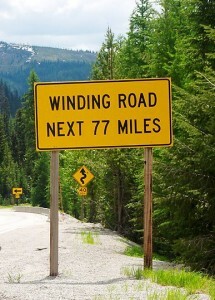 US12, the windy, two-lane mountain road through the area, is dotted with signs warning of wildlife crossings and rock slides. Mom and pop lodging establishments cater to whitewater rafters, hunters and cross-country skiers. When Exxon began staging hearings along the route about their project, they were confronted by a population more concerned with protecting their communities and the land those communities rely on, than with accommodating outsiders with a far away agenda. Injunctions, resolutions and ordinances against the tar sands heavy-hauls began keeping the modules trapped at the Port of Lewiston, costing the oil giants millions of dollars. As much as the scenery of the northern Rockies invokes the inner environmentalist in some, so too does the region’s distance from the alienation of large cities invoke in others a demand to be seen and heard by global interests. David is forcing Goliath to look him in the eye. Perhaps Manifest Destiny and post-WWII economic might had trained many Americans to expect to always be at the top of the economic food-chain, but for folks in this neck of the woods it seems other influences are calling the shots. The introduction of the tar sands shipping corridor through Idaho and Montana introduced a lot of area residents to corporations they had never heard of before: Imperial, Harvest, Sung Jin, Mammoet. The major players in Big Oil today do not hail from just Texas. State-controlled oil companies from Europe and Asia have invested billions in Alberta’s tar sands in recent years. Global production of crude oil is falling and demand is rising; and oil-hungry countries desperately clinging to the false-progress of industrialization are scrambling to control the last of the world’s reserves. And just like the divvying-up of the Americas after Cristoforo Colombo got lost on his way to Japan, and the parceling out of Indian territory after US independence; the world’s wealthiest states are dividing up the last supplies of the most sought after drug on Earth without regard for the people in their way. In particular addition to US and European corporate investment are the emerging powerhouse economies of eastern Asia. China is buying up as much control over Canada’s tar sands as they can get away with. Korea is taking over tar sand contracts from manufacturing to shipping, as well as operations in Canada itself, leaving US and Canadian companies in the dust and the world’s civilizations thirsting for more. Marty Cobenais is an organizer with the Indigenous Environmental Network, co-sponsor of the International Tar Sands Resistance Summit. He’s been working with communities along the Keystone XL’s route for the last two years, trying to prevent oil and gas companies from destroying land-based people’s homes from Canada to the Gulf of Mexico. The Alberta Clipper oil pipeline passes just two miles from his office in northern Minnesota. At the ITSRS in the mountains of Montana, Cobenais had few reservations about the strength of his words against the Tar Sands. He feels he is fighting a war. He and his relations have been resisting the colonization of his country by European settlers for hundreds of years. Now even those settlers are finding themselves under the work-boots of a new wave of colonists marching to and from the Alberta Tar Sands and are joining forces to defeat a common threat. NRRT would also like to thank all of the presenters, trainers and attendees of the ITSRS 2010; caterers Seeds of Peace, and gracious host Lubrecht Experimental Forest. The Idaho hearing officer sided with the three opponents of the mega-loads yesterday. The shipments, the Connoco/Phillips ones, will be again put on hold until a full contested case hearing is conducted. The company has 14 days to request a reconsideration of the decision. The date for the next hearing has not been set, but the three opponents who filed suit against the shipments during the summer will be allowed to participate in the hearing. Ten others requested participation in the hearing, and the decision regarding their request is still forthcoming. We applaud the work that folks in Idaho have done so far and wish them the best of luck. We did it!! 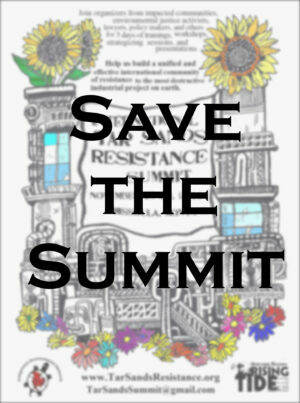 We saved the Summit (and the poster)!!! In just 36 hours, more than $6000 was raised and the International Tar Sands Resistance Summit was saved from cancellation. Almost all of the donations were under $50. That’s true grassroots organizing in action. It’s a proud moment. Deep gratitude to every person who donated. And the poster has been restored!!! Activists are registered. But an unforeseeable funding complication could stop the whole thing. We must raise $6,000 by Monday evening. You are needed now in the fight against the most destructive project on Earth. 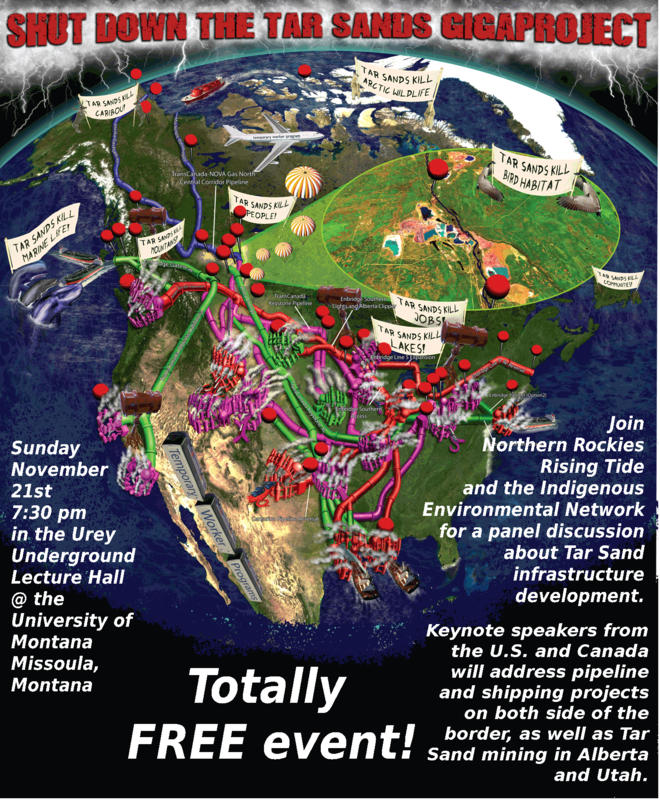 We at Northern Rockies Rising Tide have been involved in organizing an International TarSands Resistance Summit to take place just outside of Missoula, Montana from November 19 – 22. To promote this event we were working in collaboration with the Indigenous Environmental Network, local community groups, and national environmental organizations. The notion of the camp is to bring together communities directly impacted by Tar Sands development and related infrastructure projects to learn from each other, strategize, and take actionagainst what some have characterized as the most devastating industrial project on the planet. To this end, we have invited organizers and engaged citizens from communities impacted by the XL Energy Pipeline, the Alberta Tar Sands, the Utah Tar Sands (which would be the first Tar Sands surface mining operation in the United States), and themega-load shipments to attend the Summit. The response we have received in support of this summit has been amazing. — and restore this great poster! When we began organizing this event, we were promised a budget of $20,000. The intended use of the funds was to provide free food, lodging, trainings, and some transportation for attendees. Plane tickets for trainers were purchased with the intention of reimbursement, the site for the summit was visited and reserved. Friday evening we received word from our sole sponsoring organization that the funds specifically promised to us for the camp were no longer available. The reason for this was not political, the sponsor is still in great support of the camp. Rather, they had expected funds that they did not receive, and helped plan a summit they found out that they could not pay for. 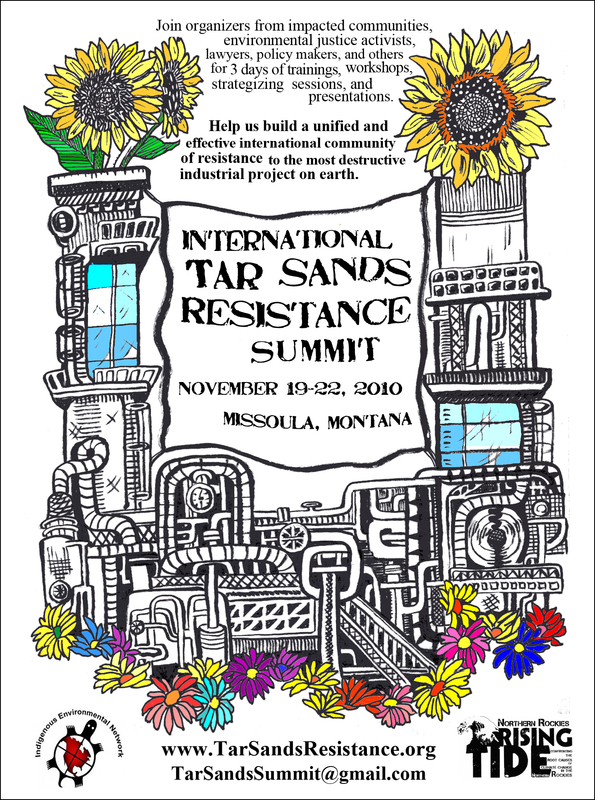 The International Tar Sands Resistance Summit is being organized by Montana-based grassroots organizations. Our working fund is minimal and we simply do not have the money in hand to put on this event. So, we are turning to you, the community of supporters who have given so much to the movement, to ask you to give a little more. The minimum amount we must raise by Monday night is $6,000. The camp is in one week. Please help us further the fight against the Tar Sands. The Indigenous E nvironmental Network and Northern Rockies Rising Tide are pleased to announce the “International Tar Sands Resistance Summit,” which will take place November 19-22 at the Lubrecht Experimental Forest conference center, 30 miles east of Missoula, Montana, USA. The summit is designed to be a place where individuals representing tar sands-impacted communities can come together to strategize, learn skills and network in order to grow and strengthen the international effort to effectively resist the most destructive industrial project on the planet, the Alberta tar sands. The four-day convergence will focus primarily on connecting individuals and communities affected by the Alberta Tar Sands, the XL Energy Pipeline, and the proposed mega-load shipments. This event is free and open to the public, but due to limited space we will have to cap the number of attendees. Feel free to register online, but please be sure to read the information provided on the form. So what does this mean for the folks in Idaho and the fight to halt the shipments? They think it’s a great step forward. The court did not touch on any of the regulatory matters to which the original lawsuit pertained. This means that that the court has opened the doors to other forms of regulatory appeal, including a direct appeal to the Idaho Department of Transportation through a contested case hearing. The interest here is that this type of hearing opens the door to much more extensive public involvement, something that hasn’t been part of the decision making process for the shipments in Idaho. With this decision the hope that the shipments will be further stalled in Idaho is strong, giving us more time to build public pressure here on the Montana side. So, come to a meeting, get involved in the way that you see fit. We at NRRT cooking up some exciting projects for the near future so stay tuned or come to a meeting.